Real Life Assignments: Run for yer life! So, here we have a tricky shoot that tested everyone's resolve, patience and problem solving ability almost to the limit. My client asked for an image that would showcase the amazing beam penetration power and brightness of their new high-tech LED headtorch design. The image would need to relate to the outdoor trail running market and would be used for brochures, web-site, point-of-sale and an exhibition stand at shows. And it had to be shot by the end of June to go to press. When we had our initial conversation in May that looked like an easy deadline. But that didn't account for the inevitable production, supply and delivery problems that prototypes always seem to attract. So my protype sample didn't land 'till mid June, just in time for the British monsoon that we like to call summer these days - gulp! As each day dawned, I awoke to stare at the rain-splattered skylight above my head. My client took to 'phoning after breakfast to ask if we had as many flood warnings as he was getting and if there was any chance of getting out to shoot this thing. I had my models on stand-by waiting for a break. And of course the whole thing is compounded by being a night-shoot. 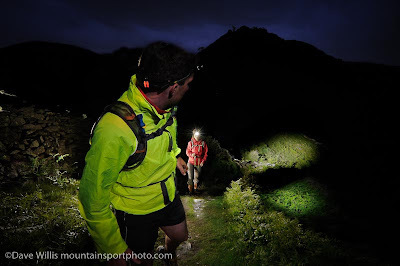 Yup, it's a headtorch, so it's gotta be done after dark, which at this latitude, in mid-summer (ha!) means 10.30pm earliest. Finally, as the deadline approached we got a dry day and it was all systems go. I met up with my runners in the car park at Mardale Head, Haweswater at the witching hour and pot my gear stuffed into a rucksack. the plan was to climb up onto the Riggindale ridge above Hawsewater reservoir with its' great backdrop of fells (High Street and Kidsty Pike if you're interested). There's a really nice trail that runs down the ridge and I thought I might even get some moonlight over Hawsewater itself. We sweated up the walk-in the high humidity, even at this hour, grateful for a light, cool breeze moving the air over the ridge and everything looke set. I found a good location, set up a lightstand and a tripod and unpacked the Nikon. The 18-35mm ED lens went on, as did the PW Flex mini and the AC3 controller...and then it started. Midges! Sheltered from the slight breeze, and surrounded by bracken, a small stand of pine trees and water, we realised that we had calculated for everything except the nightmare that is the Lake District Midge! Within seconds we were surrounded by swirling, voracious cloud of millions of the little b*****ds all looking for a blood meal. And this wasn't funny. If you have never encountered midges in great numbers you can have no idea. They get in your eyes, up your nose, in your ears, down your shirt. When it's this bad, you simply cannot stand in one place for more than a few seconds. You actually have to run away. A technically challenging, creative photoshoot, in the dark, is simply out of the question. Having put so much effort into getting here, and what with the pressing deadline, I wasn't about to bail just yet. I figured if we just legged it up the ridge a bit we'd get the breeze back and escape the midges. They can't fly in a wind. So up we went. And for a while it worked. Long enough for me to start making some shots anyway. Technically this is a tricky shot. The problems are thus; I have to use a slow exposure to record the torch beam's power and penetration. The human eye is like a movie camera. It makes continuous exposures. And it records accurate exposure from right in front of you to the far distance in a seamless, variable exposure. A camera can't do that. Since light falls off from its source very rapidly, what's good for right in front of you is not good for twenty meters away, or a hundred meters away. So you have to pick an exposure value (shutter speed) that will record the best compromise of front-to-back lighting without burning out the foreground. But that might fail to capture the real distance that the torch can penetrate. Hmmm. And at the same time, using a slow shutter speed to expose for the ambient torch-light will inevitably result in motion blur in the models, which I didn't want. A lot of photos with torches end up being light trails with a bit of fill-in flash, which can look interesting - sometimes - but it wasn't the look I was after. I wanted good detail and sharpness in my models. So I had to light them with flash. No choice. Finally, I wanted to see ambient light and colour in the sky. Black skies are boring. I needed to show the mountain environment in some way and getting colour in the sky would provide contrast for the mountain background. That was important to me. So again, it would need a slow shutter speed - on a tripod - to keep everything sharp. Having worked out the techy stuff, I set up three flash guns. Number one was to camera right, an SB800 with a shoot-through brolly to light the front runner. Number two, an SB600 with diffuser cone, was on the ground behind the front runner to provide some seperation/back light. And number three was down the trail on the wall to light the back runner. This was an SB28 with a snoot to pick out the runner. All were triggered with my Pocket Wizard Flex/Mini/AC3 kit. And then the wind dropped completely and the midges swarmed again - in even greater numbers. We all gritted our teeth, swatted, scratched and dodged, and hung in there for about 10 minutes. I got about 10 frames and that was it. Time to run. I swear, if you haven't experienced these things you cannot know how bad it is. Back at the car park I was convinced we'd have to go for a re-shoot. Back at the office I realised actually we may have pulled it off. 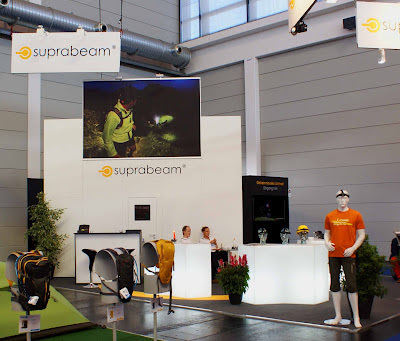 Here's the final image, displayed on the trade stand at the European outdoor show in Friedrichshafen, Germany. Thanks to David Pleasants of Suprabeam for the photo. I really like your final photo, being honest as an amateur photographer it makes me envious because I would not have any idea how to use the conditions you had to create such a shot. The outline of the hills and the blue sky provides so much atmosphere and how you have used the male runner looking back to focus the eye on the light is really clever. Out of interest how are the light units you used powered? Did you have to take a generator? Is the final image what you pictured in your mind before you set out? In relation to the problem of midges (I hate cycling through a swarm) may I suggest you have a look at an article one of my colleagues wrote on midge protection. http://www.cheaptents.com/blog/midges-and-midge-repellent-a-guide-to-avoiding-bites/ It is really informative and has created a lot of discussion since he posted it. Thanks for the comments. The midge article is good - Marmite eh? Who'd a thought! Lighting; all lighting was with standard AA battery powered speedlights and powerful (I mean powerful - these things cost £160 +) LED torches. It pretty much came out as planned, except that I didn't have nearly enough time to experiment with different settings before we had to run for it! 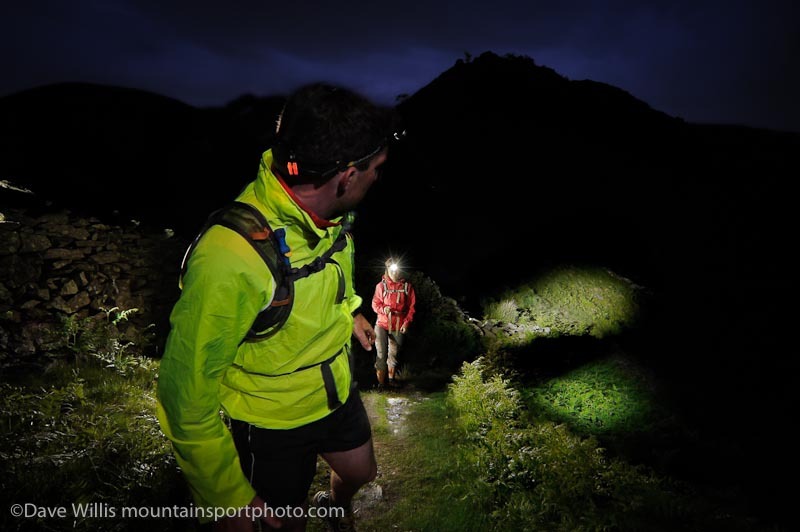 Watch out for the next instalment when I shoot mountain bikes at night! those who seem bogged down with critical written check stress.